Come along and learn the basic's of coding at Building Block Studio over this 4 week period. We have small class sizes which will enable us to provide very personalised mentoring. We'll be able to work closely with our students and move along at a pace that suits them. We will start with Scratch and complete a number of little projects that will introduce the student to the thinking that is needed to write code. The goal will be to get students to a level where they can move to some of our other courses such as robotics programming, Minecraft coding, web and mobile app coding. Students will be introduced to the Scratch 2.0 programming tool. We will cover some of the vocabulary used in the software, terms such as sprite, backdrop, actions, costumes etc. Students will be walked through the process of having two characters tell each other a joke. This will require the students to understand the timing attributes of the code they are using. Basic animation is then introduced to the students, we discuss the animation is like a flick card book, that the computer has a number of costumes for the sprite and it can quickly change them so that it looks like the sprite is animating. Students will build a basic animation by using the 'next costume' block and experimenting with a wait block to make the animation smooth. Students then move onto learning about sounds and complete a challenge which involves them animating characters and sounds. We introduce students to variables this week and show them how they can use them to keep score in their games. 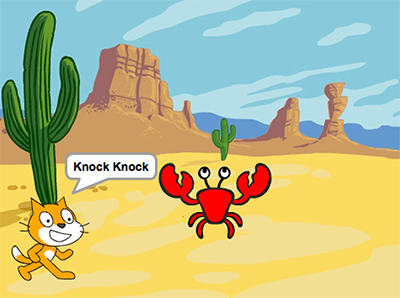 We continue to build basic games that help them to explore the various blocks that Scratch has to offer. We'll tap into their creativity and draw up a custom road and car that we will attempt to drive down. We'll use the if statement and touching block to determine if the car stays on the road. For good measure we'll set up a variable to keep track of how long the task takes. ACTDIP020 : Implement digital solutions as simple visual programs involving branching, iteration (repetition), and user input.